You think with an inciting incident as extreme as the one at the end of The Long Earth, the follow-on book, The Long War, would be an exciting series of battles. If you thought that, you’d be wrong. Instead, authors Terry Pratchett and Stephen Baxter take the Speaker for the Dead route by aging the main character of the first book by at least a decade and throwing in heavy doses of non-human racism (speciesism?). For a book that has “war” in the title, there isn’t much war at all. This is disappointing for many reasons. Sure, there’s still plenty of neat science fiction ideas presented here, but The Long War exhibits the same problems that were present in The Long Earth. First and foremost, the wit and humor of Terry Pratchett is hardly to be seen in this book, only occasionally popping up to add levity to a situation. Secondly, there’s so much exposition that the book “tells” instead of “shows,” that it almost becomes a bore to read. Finally, with so many subplots strung together, it was difficult to know precisely what was going on, who these characters were, or why I should care. I’ll still probably suffer through the rest of this series since I don’t have to think very hard when I’m listening to the audiobook. The fact that I want to get through this five-book series as quickly as possible says something, though. The real problem is that the ideas and settings presented here could have been great. If the end of the first book had transitioned seamlessly into this one, causing the people who could “step” to rise up against those who would perform the despicable act that affected datum Earth, then we’d actually have a war on our hands instead of . . . this. Don’t even get me started on the ending, which I’m pretty sure had a good paragraph of dialogue copied from The Long Earth. 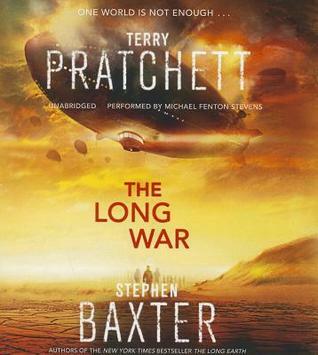 An overly long book with little to no war, I give The Long War 2.0 stars out of 5.